Why Should Your Child Attend the Imago Dei School? Trinity Classical Academy has been educating children with learning disabilities since 2001. In 2011 we opened the Imago Dei School for students with developmental and learning disabilities in order to more fully serve an underserved population in the Christian and private school communities. 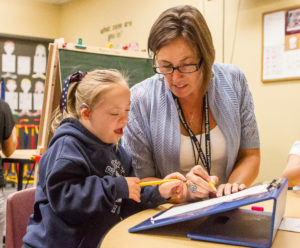 Now, The Imago Dei School is the only Classical Christian special education school in the nation, and is setting the standard for Christian special education. We offer a full range of academic and support services for students in grades K-12 who have been diagnosed with developmental and/or learning differences. Our program is designed to support students in their academic, social, emotional and spiritual needs so that they may reach their full potential to the glory of God. We offer a small class size with a low student-to-teacher ratio (2.5:1), ensuring all students receive an educational plan tailored to meet their unique needs. Educational therapy is an important aspect of every Imago Dei school student’s plan, helping them to achieve the cognitive change necessary to reach their full potential. We encourage students to excel and thrive through participating in the vibrant Trinity culture through inclusion in an extensive array of mainstreaming opportunities, electives, and extra curricular activities. Our curriculum is accredited by the Western Association of Schools and Colleges (WASC). Each student participates in our innovative Social Thinking Program, which helps students learn the skills necessary to succeed in life. High school students participate in our unique Transitions Program – including intentional Community Based Instruction, Travel Training, Vocational Skills Training, Social Thinking Training, Jobs on Campus and Job internships off campus – which helps them plan for a bright and successful future.